Ray Beattie Sensei- Courtesy of Eugene Kitney Sensei. and to the community through Celtic heritage organisation. 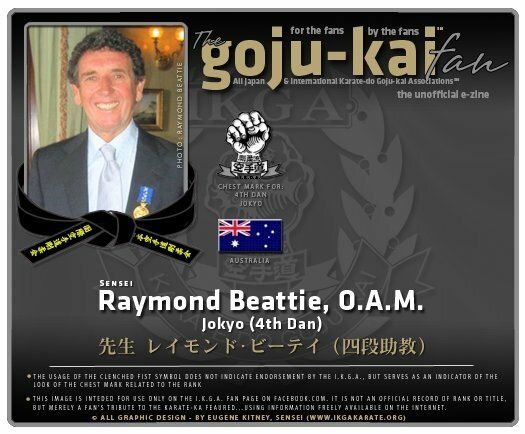 Ray Beattie Sensei commenced training in Sydney Australia with Paul Starling Shihan, in private lessons at the Private Dojo in Hornsby in the mid 1970's (approximately 34 years ago). During this period of time, most of Ray Sensei's development in Karatedo has been through personal instruction by Starling Shihan along with periodical attendance of classes, seminars, and camps. Amongst Ray's early Karate camps were those at Tallangatta on the Victorian Border (circa 1975-1977) when Saiko Shihan Goshi Yamaguchi taught, along with his sister Wakako Yamaguchi Shihan (former All Japan Female Kata Champion), and Kihei Sakamoto Shihan (former All Japan Kumite 2nd place medalist, for both JKF and IKGA). Beattie Sensei came from a sporting background, having played Rugby League prior to commencing his Private Karate training. In those days, he held a very senior executive position at a Sydney based Television Station, so he turned to the Martial Arts as a form of stress relief as well as for physical fitness, flexibility, and self defence. Since obtaining his Instructors credentials in the I.K.G.A, Ray has also become qualified as a Yoga teacher, and as a Reiki Healing Practitioner. These days he assists David Harrison Jokyo at times throughout the university semester, at the Macquarie University Dojo, not only with Karate Instruction but also teaching Yoga, Meditation, Stretching, and Breathing methods, as well as Self Defence Techniques. Ray Sensei's forte has always been Kumite related, and he was known as a very fierce and determined fighter in his younger days. This was as a result of countless hours of sparring with Paul Starling Shihan as well as bag and pad training, in the old Hornsby Private Lesson Dojo. Many of the Sydney Black Belts from the regular classes received a shock when facing off against Ray in Kumite. Over the years he had become a very strong and effective fighter through his 'Private Lessons' and his talents had not been fully revealed to some of his more unsuspecting sparring partners. Amongst his fighting qualities were his relaxed explosive execution of techniques, plus his unprecictability as well as his spontaneous reactions. These had been honed by continuous defence against attacks with a Shinai (bamboo sword) every lesson by Paul Starling Shihan. Ray Sensei credits his Karate training with helping him in many areas of his life. When he first started, he was used to relying on physical strength and aggression brought forth from his previous sporting involvements. Through his Martial Arts exposure, he learned to remain calm and centred, thus focusing his energy on the situation at hand. These qualities were also advantageous to his later pursuits of Yoga and Reiki. He is also a qualified Karate Sports Coach, through the National Coaching Accreditation Scheme hosted by the Australian Karate Federation (AKF). Ray has now gone full circle, as he was a former Australian National Sports Commissioner (which was in the administrative area of Australian Sports) progressing through to his present role of Karate Coach. · Executive Producer, many fine Australian films including Young Einstein and Pricilla Queen of the Desert. · Former President of the North Sydney Bears Rugby League Club. · Australian Scottish Heritage Society. Former Australian Film Commissioner -Australian Film Commission.